The “Bubble Bobble: Lost Cave” Project aims to create a new experience for every lover of the classic Bubble Bobble arcade game, designed by Fukio “MTJ” Mitsuji and crew back in 1986. The aim is to provide the original Bubble Bobble coin-op with a whole hundred of different levels. 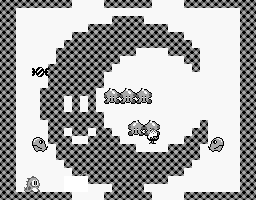 Gameplay-wise, the game is going to retain all the mechanics of the original, but Bubblun and Bobblun will have to face a 100 challenging new stages. These levels are not new at all, though. They come from the home consoles/handheld versions of Bubble Bobble. Back then, developers used to enrich the coin-op conversions with exclusive levels and features not present on the original arcade machines. 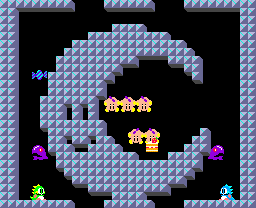 Taito granted almost every Bubble Bobble version with some kind of unique content. We played and documented every single level from all Bubble Bobble conversions, and gathered all those ones which are not featured on the original coin-op. Have you ever played the Nintendo Entertainment System, Sega Master System, Game Boy, MSX2, Game Boy Color versions of the game? Chances are good you remember some of those bizarre variations upon the Bubble Bobble canon. The full-screen level, the way it was meant to be played, no scrolling! Because that exclusive console/handheld content deserves to be appreciated in the full glory of the coin-op game system! Conversions did a great job in recreating the original Bubble Bobble “engine”, but they suffered from various kinds of hardware limitations. NES and SMS versions felt nowhere as frantic as the original; handheld versions were flawed by the smaller display, which forced the developers to enable scrolling to let players explore the whole stage, while tuning down both pace and difficulty (because it’s a little bit frustrating to land over a flying Pul-Pul you couldn’t see or avoid, you know). Once put inside the original coin-op game system, console/handheld levels play very, very differently – they get vastly empowered by that special something which makes the Bubble Bobble coin-op one of the best videogames of all time. Here it is, on the coin-op, ready to be played in 256×224 resolution! The “Bubble Bobble: Lost Cave” Project is a labour of love, totally no-profit. It wants to celebrate the incredible talents of Mitsuji-san, which sadly passed away in 2008 at 48. Needless to say, his design intuitions will live forever. As an old bubble arcade player, thats Amazing ! Can’t wait to test it! Thank you so much. This was made mostly for people like you/us, who was there at the arcade and may enjoy a new challenge on the good old coin-op! Love it! Just wrote a post in Spanish and was surfing wordpress to find something related and… bingo! I’m so glad you made a sequel to Bubble Bobble, no game is as addictive as BB. the attempt to create a different version of BB failed! Your cabinet is simply amazing, my friend! This is a labour of true BB love. We like it and approve it totally! Even if silent, we worked a lot on Lost Cave in the last months. I’m happy to anticipate to you that a new version of Bubble Bobble: Lost Cave is going to be released on December 11th. This is going to be the final revision for our little romhack, providing fixes and tweaks based on one year of user feedback. Moreover, we are going to release a tool to play Lost Cave even on the BOOTLEG (“Bobble Bobble”) printed circuit boards. This tool is great for owners of a bootleg PCB, since they can also use it to make the bootleg behave exactly like the original game (no weird behaviour, no slowdowns, no bObble and so on). Because of this final revision coming, we held back the full illustrated guide to the game levels, which is ready, actually. So… stay tuned, good things are coming. I just found a original. Bubble Bobble conversion in a WOR cab. It’s fantastic! And I still can believe I own it. Bubble Bobble has been on my list since I got into arcade collecting. When I found this Lost Cave I got excited like a kid at Christmas! Bubble Bobble is now my showpiece, I’d love to get a set of Lost Cave roms if they are ever available for sale. I’ve been trying to get this to run on MAME OSX 0.135 and I’m having difficulty. I am no programmer and have read the readme file but it is beyond me. I may have access to a lot of the ROM sets of bubble bobble games but am a bit lost. Help is greatly appreciated. I have point and click skills only! Thank you!